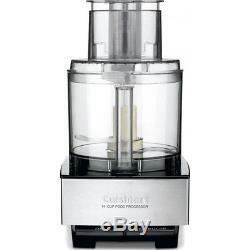 Cuisinart 14-Cup Large Food Processor with 720 Watt Motor in Stainless Steel DF. 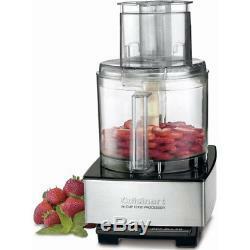 Cuisinart 720W food processor is a powerful multi tasker for your kitchen. Prepare big meals in less time with 14 cup work bowl & extra large feed tube. All-in-one legendary performer has 7 food prep functions along with single touch operation. The 14-cup food processor, DFP-14BCNY by Cuisinart does everything you need for your busy kitchen. It tackles 7 food prep functions like mix, chop, shred, slice, puree, knead, emulsify, and mix dough with minimal effort. Cuisinart's multi food processor is specially designed to make your cooking process fun and easy. This do-it-all food processor is a smart solution for your large and quick meals or weekend celebrations with the use of the large 14-cup work bowl and extra large feed tube. It also equipped with slicing and shredding discs, dishwasher safe parts and a chopping and mixing blade to tackle the biggest foods and recipes. When it comes to quality and performance, the DFP-14BCNY 14-cup food processor by Cuisinart is the one to count on! Powerful 720-watt large capacity food processor. Easy to operate ON and OFF/pulse buttons. Equipped with 14-cup work bowl, extra-large feed tube. DFP-14BCNY includes stainless-steel slicing disc, shredding disc, and new chopping blade. Includes small and large pushers, spatula, recipe booklet and dishwasher safe parts. You Name It, It does It! The DFP-14 does everything you need--mix, chop, slice, shred, knead, emulsify, puree, and mix dough. Durable, Dependable and Sized for Big Jobs The 14-cup work bowl has the ability to process large amounts of food for family-size meals and entertaining purposes! Maximum Power Heavy-duty 720 watt motor makes prepping large quantities fast and easy. Extra-Large Feed Tube Accommodates whole fruits and vegetables to fit inside for less pre-cutting and with ease. On, Off, Pulse Control paddles provide a single-touch experience. Precise Professional Results The durable and consistent stainless steel blades power through any prep task, from single garlic cloves to heavy dough. Stainless Steel Standard Slicing Disc. UC Weight: 17.30 pounds UC Cubic Feet: 1.00 Dimensions (L x W x H): 11.00 x 7.90 x 14.80 inches UC (L x W x H): 12.50 x 9.25 x 15.00 inches MC Quantity: 1 MC Weight: 18.50 pounds MC Cubic Feet: 1.14 MC (L x W x H): 13.00 x 9.75 x 15.63 inches. 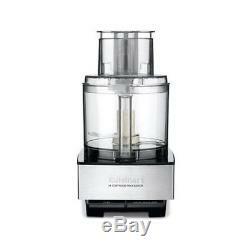 Cuisinart 14-Cup Large Food Processor with 720 Watt Motor in Stainless Steel. Please note that - depending on your geographic location - not all methods are available. Make sure to select the appropriate method. APO / FPO Military Addresses. Sellers are not responsible for service transit time. Battery, charger, cords, straps, etc. The RA number or any other inscriptions must not be written or printed on the product box or packaging. We will not process the return if any of these conditions are not followed. Retuned merchandise that is lost or damaged during transit is solely the shipper's responsibility. When you receive your order, we recommend that you keep all packing materials in case you need to return the TV. If you just don't like it. You'll also need to pack the TV in its original box with all original packing material, and accessories. It is important that you inspect the TV (not only the box it came in) prior to signing for it. A replacement will be sent immediately after we are notified about the damage. If your TV does not seem to function properly. We'll help troubleshoot and determine how to solve the problem; if we can't, we'll arrange for service to assess the television. Opened packages of Apparel, Bedding or Linens. Consumables, including but not limited to, recordable media, film, tapes, batteries, paper, and ink. (substitute Buydig where appropriate) In addition, customers located in Pennsylvania should note that in accordance with a new law passed by the state in 2018, retailers including Beach Camera (Buydig) will be required to submit an annual report to the Pennsylvania Department of Revenue listing any sales made to customers located in the state. The item "Cuisinart 14-Cup Large Food Processor with 720 Watt Motor in Stainless Steel DF" is in sale since Wednesday, March 14, 2018. This item is in the category "Home & Garden\Kitchen, Dining & Bar\Small Kitchen Appliances\Food Processors". The seller is "buydig" and is located in Edison, New Jersey. This item can be shipped to United States, Canada, United Kingdom, Denmark, Romania, Slovakia, Bulgaria, Czech republic, Finland, Hungary, Latvia, Lithuania, Malta, Estonia, Australia, Greece, Portugal, Cyprus, Slovenia, Japan, China, Sweden, South Korea, Indonesia, Taiwan, South africa, Thailand, Belgium, France, Hong Kong, Ireland, Netherlands, Poland, Spain, Italy, Germany, Austria, Israel, Mexico, New Zealand, Philippines, Singapore, Switzerland, Norway, Saudi arabia, Ukraine, United arab emirates, Qatar, Kuwait, Bahrain, Croatia, Malaysia, Brazil, Chile, Colombia, Costa rica, Dominican republic, Panama, Trinidad and tobago, Guatemala, El salvador, Honduras, Jamaica.